I remember hearing about Jars of Clay in college. I’ve been listening to them ever since. They are a fun Christian-Rock band from Tennessee. Who wouldn’t love them. 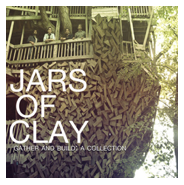 NoiseTrade is offering a free Jars of Clay album download of the â€œGather and Build Collection.” There’s a collection of 11 songs. When you go to NoiseTrade, you can donate anywhere from $1-$100 but it’s not necessary. The download is free. Enter your email and a code will be sent to you to complete the download.